You already know that meditation is a global phenomenon, and is associated with improved physical health, increased happiness, mental clarity, and lower levels of depression, among its many benefits. While you may have tried to sit still once and a while and capture some of the benefits of meditation, you don’t have a clear picture of what to do or how to really get started. If you’re a beginner to meditation, you probably have a bunch of questions. Like, which kind of meditation is right for you? What type of posture is best? And if you’re brand spanking new to it all, how and where do you actually begin? Read through this insanely comprehensive guide, as we have ALL the information you need to begin a fantastic journey into a new world of meditation. So, how exactly do you meditate? If you’re new to meditation, start with only 5 to 30 minutes per day. While experienced monks might spend hours meditating every day, there’s no need to jump in that far. You’re more likely to maintain a regular meditation practice if you set a reasonable timeframe for yourself. Don’t skip days, or you’ll struggle to establish a steady routine and reap the benefits. Try setting a regular time and place for your meditation, and prioritize it. You may be unaccustomed to sitting on the floor, for example, but with time you’ll soon adapt. Use a cushion as needed for comfort. Find a place that is reasonably quiet where you will not be disturbed. You can try sitting in the same place for meditation every day, as your mind will begin to associate that place with conscious breath, inner peace, and deep concentration. Some people enjoy meditating with a likeminded community, a group of people who gather to meditate in silence together. If this interests you, check if there are any meditation groups in your area. Belonging to a group also increases your sense of accountability and may make you more likely to stick to your new practice. Many meditators enjoy the guidance of a meditation tape, especially when they are new to practice. These tapes are plentiful, and you should be able to find one that’s to your liking. To that end, I’ve compiled a list of mindfulness and meditation apps toward the end of this book. Begin your meditation by focusing on your breath, on the sensations of inhaling and exhaling. There are many things you can focus on while meditating—a mantra, a flame, an image—but the breath is one of the most fundamental. OK, now what posture should I take? You can meditate in a variety of postures: sitting, walking, lying down. I will now sketch these meditation postures and offer advice. First, where should you sit? You can either sit on the ground (with or without a cushion) or on a chair. Find a quiet place with few distractions. Next, how should you sit? Many people spend hours sitting at a desk or in front of a computer, and this tendency can wreak havoc on our necks and backs. In a typical “work” posture, we round our shoulders and push our necks forward. Your meditation practice is a chance to break this habit and undo some of its harm. If you’re especially tight or stiff, consider stretching for a few minutes before settling into your sitting meditation. You may take a few moments to scan your body, starting at the head and working your way down to the feet. How does the head feel today? The neck? Any stiffness or soreness? And moving down to the shoulders, arms, hands, torso, hips, legs, feet, and toes. Notice areas of discomfort if any exist, any tightness or tension. Or perhaps you’re feeling especially loose and relaxed today and can enjoy the simple pleasure of feeling good in the moment. Whatever observations you make, try to make them without judgment. There’s no use lamenting right now that your crappy left shoulder is feeling tight again—make this observation, then breathe and let it go. How should you perform a formal walking meditation? Walk slowly and with intention. Typically, we walk briskly without really thinking about it. In walking meditation, you want to slow down and notice each component of the step. Lifting – lifting your foot off the ground. Moving – moving your foot forward. Placing – placing your foot back down on the ground. Shifting – shifting your weight from one foot to another. As you walk, concentrate on each part of the movement, using these words to guide and focus your mind. Think to yourself, “Lifting…Moving…Placing…Shifting…Lifting…Moving…Placing…Shifting…” and so on. Allow your eyes to remain open (you don’t want to trip) but with soft focus. Ideally somewhere private and indoors, where you won’t be disturbed by people who are confused about what you are doing! Choose somewhere with level terrain and no obstructions. For now, you want to focus on the movement of your body, rather than on navigating complicated terrain. Finally, find a space that allows you to walk in more or less a straight line for at least ten paces or so, so that you are not constantly turning around. There is also a less formal kind of walking meditation, one that is more compatible with walking around in the outside world. How much time do you spend walking each day? Do you walk into town to run errands or walk your commute to work or school? If so, you probably do a good deal of this walking on autopilot. Once you’ve memorized your route, you can walk it without really paying attention beyond the bare minimum (hopefully you always check for traffic before crossing the street!). Next time you have to walk somewhere, though, why not try doing so with more mindfulness? As you walk, look at your surroundings. Notice that so-and-so who lives over there has a nice garden. Notice that there’s a wasp’s nest up in that tree. Notice that this house has been painted a new color. Notice the sounds and smells all around you: the noise of cars and buses, the conversations of other pedestrians, the songs of birds, the smell of flowers. Is the air humid or dry? Is the sun shining or hidden behind clouds? How does your body feel as it walks, loose and relaxed or tight and in pain? Taking the time to notice and observe your body as it moves through its environment centers you firmly in the present moment and gets you in touch with how you are doing and feeling that day. There are few things healthier or more calming than mindful walking. You can also meditate while lying down. There’s always the risk of drifting off to sleep, but that’s not necessarily a bad thing if you do a lying meditation in the evening as a way to calm your mind before rest. In fact, I think it’s an excellent way to end each day. Count your breaths as they come and go. Scan down your body and take inventory of how it is feeling. Feel the weight of your body as it presses into the ground or bed. What does yoga have to do with meditation? Originating in ancient India, yoga takes on many forms today. There are multiple schools of yoga, multiple ways to practice, and multiple goals. What I want to focus on here is hatha yoga. Its various postures stretch and strengthen your body and improve your sense of balance. Undertaking a mindful yoga practice is also a wonderful way to enjoy moving your body. If you spend most of your day sitting, you may be reluctant to spend even more time sitting by performing a sitting meditation. In this case, practicing yoga is an excellent way to foster mindfulness while also allowing your body to move. While it is possible to perform yoga the same way you would any other exercise, I suggest bringing the same quiet, calm, mindful energy to yoga as you would to a sitting or walking meditation. Focus on your breath. Notice how your body is feeling. Pause and scan your body. Accept both its strengths and limitations. 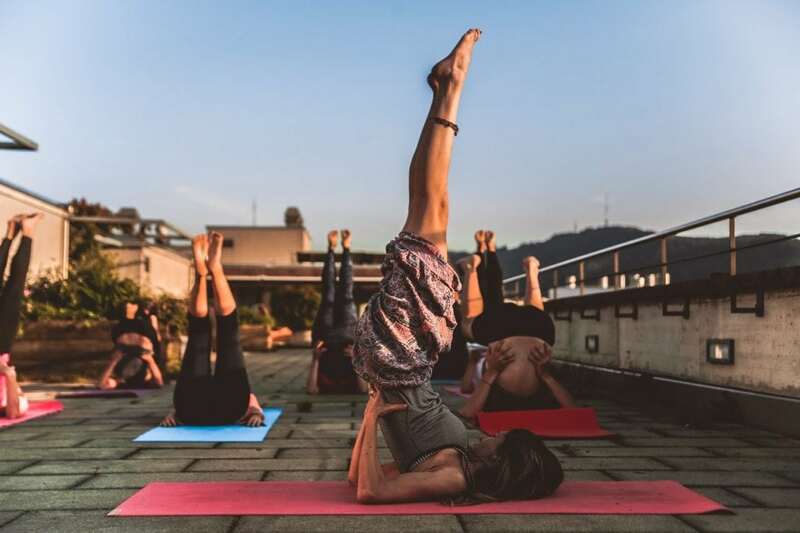 Yoga is quite difficult to learn from a book, so it’s recommended to take a class from a qualified instructor or find a video that you like and follow along. According to Master Buddhist Thich Nhat Hanh, this is the most simple and basic meditation technique but also the most useful. Why? Because we’re always breathing. You can literally practice this anywhere, anytime, even if it’s for 15 seconds. According to Thich Nhat Hanh, concentration is a great source of happiness. Concentration simply means focusing on something, whether it’s your breathe, a flower or a body part. You could literally point your focus on anything, and as long as you keep that focus, you are practicing mindfulness. It’s recommended that you choose an object where you don’t have to scan your eyes. Buddhist monks tend to use a candle flame. If you get distracted by your thoughts, simply return your focus back to the object. You can start this for one minute and then keep on increasing the time as you practice more. (To learn about different mindful techniques you can use throughout the day to focus your mind and calm yourself down, check out our best-selling eBook on the Art of Mindfulness here). This is the technique Thich Nhat Hanh recommends to use to get in touch with your body. All it involves is a body scan where you turn your focus to each of your body parts one by one. As you’re going through your body, release any tension and simply try to relax. Thich Nhat Hanh says that this is powerful because we rarely experience this in daily existence. Our body is there, but our mind is elsewhere. The next exercise is to release tension in the body. When you start becoming aware of your body, you’ll notice tension in different parts of your body. Therefore, it is very important to learn how to release tension in the body. This is an excerpt from Hack Spirit’s latest eBook on How to Use Buddhist Teachings for a Mindful, Peaceful and Happy Life. By unwrapping iconic Buddhist teachings, this 71 page eBook focuses on specific actions you can take to alleviate stress, cultivate healthier relationships, and live a more satisfying life. Check it out here. Next articleHow to keep a guy interested: 10 secrets to get him hooked!